In part one, we covered the basics of how a scope works. In part two we discussed some various available reticles and how the Mil Dot scope works. Now lets discuss how to zero a scope. To begin with, what do we mean by zeroing? When we zero a rifle, we align the point of aim and the point of impact of the bullet so they are the same. Point of aim: The point where you are aiming at, which is the spot where the crosshairs on your reticle intersect on the target. Point of impact: The point where your bullet actually strikes the target. If it wasn’t for that pesky little problem of gravity, you would be able to zero your scope from the end of the muzzle all the way out to infinity and point of aim/impact would be the same. But since gravity does exist, we have to compensate for it. If I took a 150gr bullet and dropped it at exactly the same time you fired that same bullet from a perfectly horizontal rifle, they would both hit the ground at the same time. So when you fire a round the bullet is moving forward rapidly and it is also dropping rapidly. The illustration below shows the problem. If you notice the illustration above, the scope is aligned perfectly with the target, but the barrel is pointed upward at an angle designed to allow the bullet to “drop” onto the target where the sight is aligned. The distance between the muzzle where the bullet exits and the target where it hits the same point as the sight is aligned, is the range your weapon is zeroed for in either meters or yards. Notice that the bullet crosses the line of sight sometime after leaving the muzzle and then hits the line of sight again at the target. 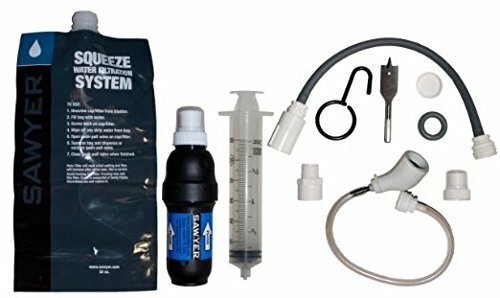 Before you take your new rifle/scope to the range to zero it, there are some things you need to do first. Make sure your scope mounts are on solid. Loose mounts will make zeroing impossible. Make sure you use the right sized machine head screwdriver or gunsmithing screwdrivers or hex head wrench to tighten them down if they are loose. Firearms use machine head screws which have straight vertical slots. Do not use a wood head screwdriver that has a taper to it. You will ruin your screw slots. Place your rifle in a rifle rest, or if you do not have one, on a sandbag where you can keep the rifle perfectly vertical. Then look through the back of your scope to insure that the crosshairs are also perfectly vertical. If they are slanted one way or the other, carefully loosen the screws on the scope rings and rotate the scope to correct it and carefully tighten the screws. Cross tighten them the same way you would the head on an engine. This is an angular measurement similar in concept to the Mil system we discussed in Part 2. It is very simple. 1 minute of angle will equal a movement of 1 inch at 100 yards. Since it is an angular measurement, that same 1 minute will equal 2 inches at 200 yards, 3 inches at 300 yards, etc. Most scopes are equipped with elevation and windage drums graduated in 1/4 minute clicks. They will have protective caps on them and will have directional marks showing right or left or up and down with directional arrows. On most, you can use a coin to adjust the drum settings. You can use a target designed for scope zeroing like the one pictured, but it is not absolutely essential. If you have a rifle rest, use it. If not, use sandbags either on a table or in the prone position. Start out close in! One of the biggest mistakes I see people do is to try to sight in a scope at 200 yards and they cannot even tell if they are hitting paper! Start at 25 or 50 yards if you have to. The idea is to get on paper first, then you can adjust as you move the target further out to the range you want to zero at. Having a spotting scope or really powerful binoculars can help you see where the bullets are hitting. Shoot a 3-5 shot group. Your 3-5 shots should be fairly close together. The picture shows and example of a group. 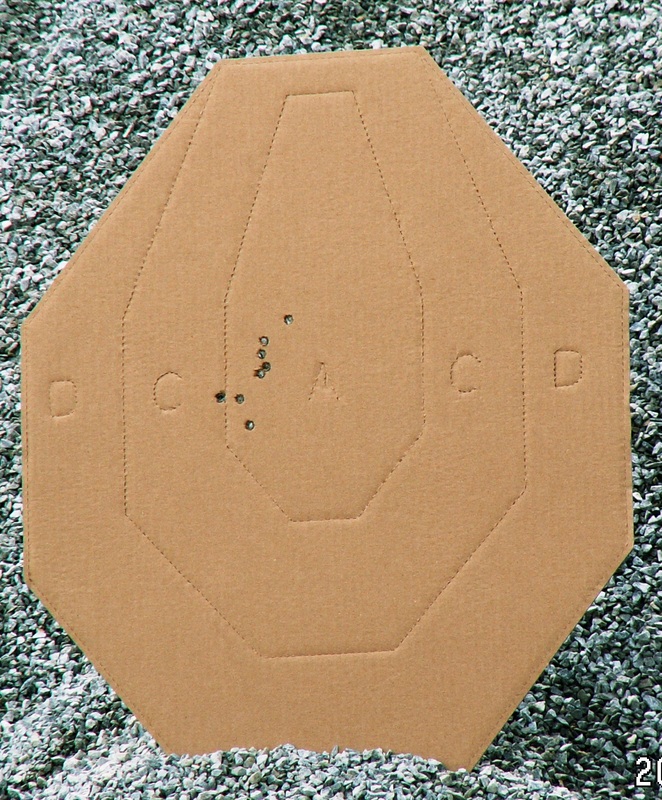 The shots are not in the center of the target, but they are close enough together to constitute a group and a group can be adjusted. For simplicity, lets say you just shot this group at 100 yards. Measure the distance from the center of the group over to the center of the target in inches. ( If you are not using a zero target with measurable squares, use the “Knuckle Ruler” . On most people the distances between the first and second knuckle on the trigger finger is about 1 inch). 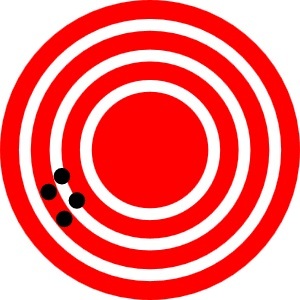 Lets say the distance from the center of the group to the center of the target is 6 inches. Since we are at 100 yards distance, we know that we need to move to the right 6 full minutes. Since our scope adjustment is in 1/4 clicks, theoretically we need to move 24 clicks to the right. Do the same thing for the vertical change for elevation and move the sight accordingly. Once you get a fairly decent center group at short range, you can start moving your target further out adjusting the sights at each distance until you have your scope zeroed for the range you want. But the main idea is to get a group on paper first before you start making sight changes. After you get your rifle zeroed to where point of aim and point of bullet impact are the same, you can experiment at different ranges to see how far you have to hold over or even, at close range , under the target. Now, what I just explained is correct theory but on a range outdoors a lot of factors will affect whats happening, especially light and wind. Initially, until you get a pretty decent zero and want to fine tune it, don’t be afraid to make BOLD sight changes. Just because in theory the 24 clicks will get you there doesn’t mean they will. If you aren’t careful, you will expend excess ammo on “creeping” your zero to where it needs to be. In this three part series we covered the bare bones basics of telescopic sights for survival purposes. There is a lot more to learn, and a number of different ways to do some of the things we discussed. If you want to be a proficient rifle shot with your scoped rifle, you need to train and practice. But please understand something. Having a scoped rifle does not make you a sniper. That is a tactical art form in itself, requires a lot of specialized intense training, and not all people are cut out for that type of work. But, having a scoped rifle and knowing how to use it effectively does give you a tactical edge in a SHTF or WROL defensive situation. In future articles I plan to cover illuminated reticles, night vision sights, and perhaps a limited discussion on the tactical use of the scoped rifle for prepper defense. Interesting how other people zero a scope. Everyone seems to have their own preferred way. I sight on the bull (usually a marker pen blob), squeeze off a few, then clamping the rifle to the sighted bull, simply adjust the cross hairs to where the shot fell. There again I was never much good at math without my abacus LOL. There are lots of ways to do it, and I know others who do it your way. It works well. Fun bit is to sight in an occuded QR scope. Longer you stare, the worse it gets.